As I’ve highlighted in past posts, the Seattle area can be a little troubling to navigate – especially for those of us with mobility disabilities. Hills are one part of life we cannot change, but when it comes to issues like crappy curb cuts, that is something that can and should be changed. In fact, crappy curb cuts are such an issue here that there is an active lawsuit and awareness campaign over them. Led by Disability Rights WA and Rooted in Rights’ #CrappyCurb campaign, disabled people in Seattle are attempting widespread changes to the ways we access the city. Curb cut – the crappy curb cut in an access aisle. The issue is the dark area between the car and the start of the curb cut. The dark area (ramp portion) is constructed in such a way that it is hard to push a cart up. Once you know what constitutes a crappy curb, it is easy to spot them everywhere. I’ll admit, the regulations governing curb cuts look a little intimidating. There are lots of numbers and ratios that come into play, and I certainly don’t (or wouldn’t) know how to check the accessibility of a curb cut from that perspective. However, there are some easier things to spot. A good curb cut will be smooth connecting the sidewalk and road seamlessly, have a textured portion to alert people who have low vision or are blind, there will be one cut for each crossing, and so on. On the short drive from my home to the mall, I have seen only one or two that fit into my description. Most are in need of repair, missing the textured bumps, have one curb cut for two crossings, or flat out don’t exist at all. Any disabled person would tell you, there is more to equal accessibility than just curb cuts. I’ve been thinking a lot about accessibility beyond curb cuts recently. It all started with a trip to the grocery store. Every week, we make the three-mile drive to our local grocery store, and every week, I see the same problem. 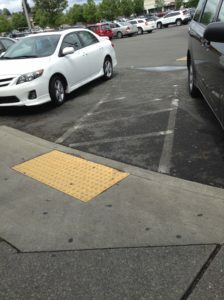 Like most grocery stores, it has a large parking lot, which means plenty of spaces marked for people with disability parking placards, but the markings are wearing down and it can be hard to see the lines. This is the number one problem in the grocery store parking lot. There are parts of the lot where the lines are so faint, a driver has to guess where they are. In particular, there are spaces near the accessible parking that are so worn down, it can be hard to tell what goes where. Most accessible spaces have a white or yellow, wide, diagonally striped area to the left or right of the space. This is called an access aisle. Many of the access aisle markings in the lot are barely visible. This means they are often used as parking spaces even though there is no sign informing of disabled parking. I don’t know much about ADA law, but I know enough to recognize that’s a no-no. I’d say that about 75% of the time we visit the store, someone has parked in an access aisle. Additionally troubling is where the access aisles connect to a curb cut. There is one access aisle I often see used as a parking space that has a crappy curb cut. One day, I tried to push a mini shopping cart up the crappy curb, and could have easily tripped and fallen in the process. Even with no car in the aisle, I would have struggled because the curb wasn’t seamless between the parking lot and sidewalk. My point about the parking lot issues was proven earlier this week when I went to the store with someone I don’t typically shop with. While we were inside, he came out and moved the car. Upon leaving the store and seeing it in the very access aisle that is so faintly marked, all I could do was laugh. Included with this piece are the photos I took. In one, you will see the accessible parking space nearby where the access aisle lines are somewhat clear, and in the rest you will see the view from the car. I didn’t think of taking a few photos of the space empty, but you can be sure the lines are so faint. To me, it is logical to not park there – even with the admittedly dubious lines. 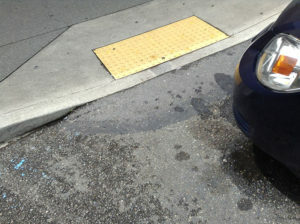 There is no sign advertising disability parking, and there is a curb cut. When we pointed out that there is a curb cut, the person said, “it needs a no parking sign.” While I wouldn’t necessarily suggest a sign, I do realize that what needs to occur is re-painting the lot to make it crystal clear. Even so, I admit that I struggle to comprehend why there is an understanding that in a store parking lot, it’s “ok” to park in front of a curb cut, but I’ve never experienced someone doing that on the street. I suspect that if a person parked in front of a curb cut on the street, they would be ticketed. The thing is, the NW Regional ADA center reports that you can be ticketed for blocking an access aisle, and the price is a fairly steep $450 if you’re caught. There has to be more as a solution to this problem than frustrated people with disabilities, who often have to sue to make change, and fines. 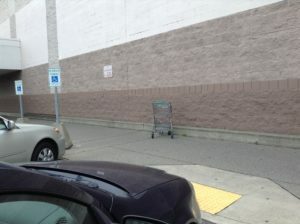 Car in access aisle – the car parked in the access aisle. The sign indicates an accessible space is for the space to the right, and you can see the faint white mark showing the access aisle. I perceive that most people believe enforcing the ADA is something to do because it’s nice or a luxury. Other than an obvious civil rights issue, to put it bluntly, the ADA is a law – not a choice. Also, this law benefits everyone. Using the examples of curb cuts or access aisles, these ADA mandated accessibility features hold multiple purposes. Most obviously, curb cuts help people with mobility disabilities, in particular, safely navigate around a place. They also benefit bikers, delivery drivers with hand trucks, strollers, and many others. Curb cuts are wonderful for when I’m tired, as I find myself tripping over everything in sight when I am wiped out, so I appreciate a lack of stepping up a curb. Unfortunately, I still can trip over ones that are in need of repair. Similarly, access aisles are a clear indication of no parking, but for people who use mobility devices, they are an essential part of parking. It is space to put your device near your car, so the transfer can be easily accomplished. This is why I’m so bothered by people parking in the access aisle at the store. What would happen if I was going to the store with a friend, and she had no place to put her crutches or walker once she parked? We would likely have to turn around because the accessible places are often full. I wonder how many people have to turn around every day in that grocery store parking lot. Imagine how accessibility would be different if there were people in charge of ADA accountability in a manner similar to a food inspector or a health and safety inspector? I realize there are often ADA compliance officers for places like school districts, but what if they were everywhere? What if they held the kind of power and acceptance that food inspectors do? That would dramatically change this conversation. People with all kinds of disabilities wouldn’t be forced into a life of adapting to a law that is never properly enforced. We wouldn’t have to police places just to have equal access. If it’s not parking spaces, it is something else. Disability rights journalist David Perry recently wrote an excellent piece about the accessibility issues at restaurants. For me, this is usually just a case of a door that is too heavy, or tables and chairs that are very tall. In comparison to some issues, these are pretty insignificant. I see many restaurants with menus that are not easily accessible, for example. How can you order if you can’t see the menu? No matter what the issue, I want to know; what do we have to do to change the conversation around the ADA? Why is this not seen as an issue of equal access, or as important as other civil rights acts? If you have any thoughts, post a comment or tweet me @ChrisDisability using #EnlightenNotInspire, and join us for the next Twitter chat Friday June 16 at 6pm pacific.